Our team in West and Central Africa (WECA), including John and Rodica Musgrave, Bayo Adeniran, and others from the WECA headquarters, traveled to Abuja, the capital of Nigeria, on Thursday, March 28. Upon arrival, they went to the Jabi church, the Abuja regional headquarters, for a tour. Approaching the building, they were met by a large group of saints, including the pastor and his wife, Dealyn and Nne George. 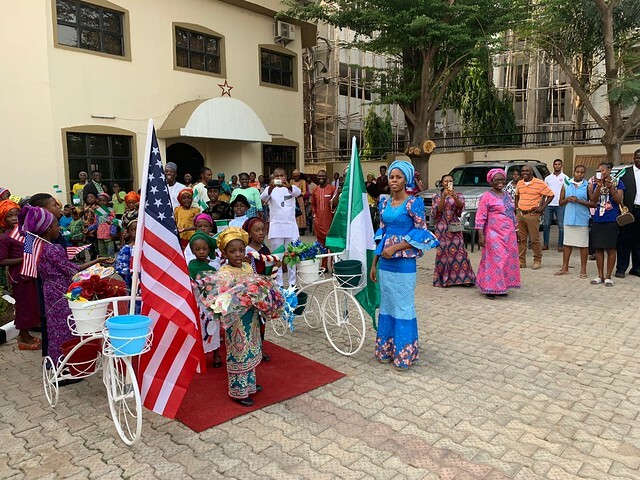 A number of excited children dressed in colorful native attire and waving American and Nigerian flags also greeted them. The children presented a formal welcome and then offered flower garlands and a bouquet. Inside the building, Brother Bayo led the tour. He had pastored the church from 2005 to 2010, and was able to give some history as they went. Brother John said he shared several instances of answered prayer that took place as the church expanded. Next, the team visited the Kubwa church in Abuja, pastored by Matthew Adio. In 2009, this was the site of the first church dedication I attended in Africa. Beautiful music continued throughout the service, including “Great Is the Lord” and “Let the Power of the Lord” sung by the choir, a solo of “Lord, Send a Revival,” and “Jesus Is Calling” by a quartet. During the announcements, three young men stood to be acknowledged as first-time visitors, and later responded to the altar call. Brother John said they had a good altar service, which continued as they were leaving. On Sunday, the team went to Ikot Enwang, in southeast Nigeria, for Sunday school and the morning meeting. They arrived to a nice welcome in the prayer room, which seats about three thousand and was nearly full. The Sunday school children who marched in as they sang “You Are Welcome in the Name of the Lord” gave a short narration titled “Africa for Christ,” presented flowers to the team, and marched out singing “Our God Is Able.” As this was Mother’s Day in Nigeria, the bouquet of flowers was passed to Sister Rodica. The Sunday school general assembly was held in the main sanctuary. It opened with the choir and orchestra performing “Praise Ye the Father,” and continued with a quartet singing “Ancient Words.” Though the sanctuary is enormous, when it came time to dismiss to class, there were so many in attendance that the adults were asked to remain seated for the lesson, while the children went to individual classes. The morning service was attended by 9,430, and featured outstanding music throughout. For prelude, the orchestra played “In the New Jerusalem,” and a brass ensemble presented “Inside the Gate.” One particularly powerful song was “Resurrection Morn,” sung by the choir and featuring a soloist. Other music included “Down by the River” by the male choir, “The King Is Coming” by the choir and orchestra, and “Stay Beside Me” by a quartet. Brother John said a tremendous altar service followed the meeting. In the afternoon, the team drove about thirty miles north to the Umuokatawom church, where about 250 saints and the pastor, Charles Onunka, were waiting to welcome them. The Sunday school children provided a special welcome and later a program inside the church, which began a short service. Afterward, everyone walked a short distance down a dirt road to the site where missionary George Hughes stayed while pioneering the Apostolic Faith work in Africa. Brother John said two seniors in the group had been children during that time and still remember Brother George. The team enjoyed hearing them tell about how he lived and worked. They said he often sat by the palm oil mill and visited with the people, and that he would go out in the evenings to evangelize. One of the seniors, Rachel, said he used to preach, “Prepare your way,” and because of him, she prayed and was saved as a young girl. Brother John said it was a very special opportunity to visit the area where Brother George helped sow the seed of God’s Word so many years ago, and to see the great harvest that is being reaped today. The Musgraves are scheduled to spend the next few days in Lagos before traveling to Lusaka, Zambia, for the start of the annual camp meeting.